I was about to write a blog post about my Self-Stitched-September 2011 inventory, when I realized how pitiful my self-made-stash really is. So rather than dilly-dally counting what I've got, I jumped into making a few more wearables. I was so satisfied with the quick and successful nature of my first Sorbetto that I assumed the same could happen with a simple pencil skirt pattern. I mean, I'm a one-night garment wizard, am I not? The answer is "not." But I get ahead of myself. The Sew Weekly's weekly challenge has historically been an anxiety producer for me. I'm like "one week! I have to make a decision AND fabric shop AND sew something? Too much!" But this week is different. This week, the theme is Mad for Plaid. And I love plaid. Especially for fall. And I'm making a skirt for fall. Purrrrfect. 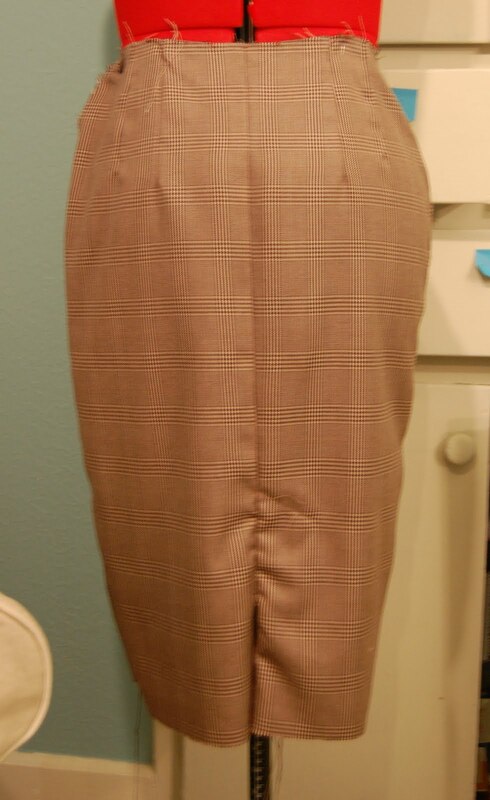 So I grabbed a poly-rayon blend suiting and cut out the pieces. Voila. Now, Simplicity is a silly name for a pattern company. It creates a constant search for irony as I sew. At every step of a Simplicity pattern I think "How Ironic, this pattern isn't simple!" OR "How Not-Ironic, this pattern is so simple!" Here is the count on 2154 so far. Only 4 pattern pieces! And two are the same. Last time I used a Simplicity pattern I cut a size 14 based on my measurements and it was enormous (I needed an 8). This time I cut a 12 and it was too small. ARG. No lining, only 1 piece of interfacing, darts are the most complicated step. The waist band doesn't look like the picture when you attach it according to the notches. The front is too long and the back is too short. Double ARG. Needless to say - I'm a little worried about this project. It was so tight on the hips after I did the side seams that it reminded me of shopping in the junior's department. I let the sides seams out a bit only to have the waist be huge. Yikes. Looks like Lizzy has some fittin' to do. Here you can see the unpressed progress I've made. Side note: I knocked my dress form funny when I was moving it last. Now it slouches. Or I guess it is just leaning forward, but it looks like it slouches. Oy. A dress form with bad posture. Not good. Bottom Line: I'm hoping this skirt comes out okay. It's fine if it is ultimately a muslin for a future masterpiece, but I'd like it to at least be wearable for SSS'11. So exciting to see a masterpiece coming into fruition.. Good luck. Also your Suddenly Sorbetto was such a success i'm sure the new plaid one will be so easy peasy! also i'm a blog beginner so you've been warned but you can check me out here http://singinsweetbird.blogspot.com/ Happy sewing!! Don't give up on this one - it has great potential. Like you said, Lizzy has some fitting to do, that's all. A few adjustments and you’ll be strutting this plaid wonder for SSS and beyond. Keep us posted. just go on with this piece. love the plaid. Ummm getting ready to make this as a beginning seamstress. A little scared about the fact that mine will need lined and there are no instructions! Yikes! Should I bail??? ?